Any time there is a food truck event, we seem to be there. Even on May 4 when it was rainy, windy, and 45 degrees. May in Oklahoma. Can you see the parkas? 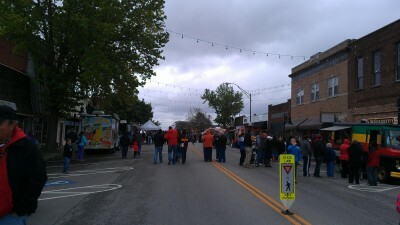 We ventured out on this super rainy day to support our local food trucks at a food truck festival in Jenks, America. We will sacrifice for a good food truck meal. The line for these sandwiches crossed the street and then started wrapping around down the sidewalk. No doubt they are delicious but it was just too long of a wait for us! But there were lots more than just trucks out. Who can resist “cheesie-loaded wonderfulness”? This takes some prep time time but all the ingredients keep for awhile for other recipes and dishes. Rinse beans and place in a large sauce pan with a tight fitting lid. Add water so that three inches cover beans. Bring to a boil, cover with lid, and turn off heat. Let set for 90 minutes. After 90 minutes, drain and rinse. (Discard soaking water.) Add back to pan and cover with an inch of water. Bring to boil, cover, and reduce to simmer. Simmer for another 45 minutes (or until done). 2. For the romesco sauce, click here. Make it while the beans are cooking. 3. Make the green-chile sour cream. Combine 1 cup light sour cream with one small (4 oz) can Hatch green chiles and 1/2 T. green chile powder. 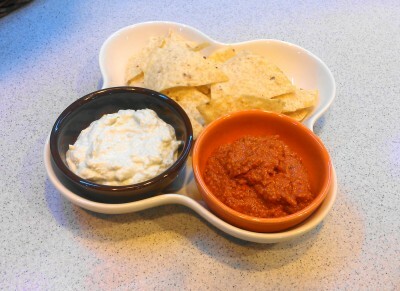 The green chili sauce and the romesco sauce also makes great dips..
4. Saute one sliced onion until caramelized. 5. When everything is prepped, create burritos. Place ingredients in order in the burrito and fold it up. Repeat as necessary. THAT is definitely some beanie cheesy wonderfulness right there. I’ll take two. I will let you know as soon as our crazy food bus is open! While I can’t see waiting in a line for that long for much of anything, I’d definitely take the time to cook that delicious, cheesy plate of food. Wow, it looks and sounds delicious. Yes, that must be one heck of a sandwich! Those colourful beans are really beautiful. Love your burrito! Thanks, Angie. I love crazy colorful and unusual food. I know your mom loved these burritos and the time you spent making them! Love the components of this burrito by themselves too. Beanie and cheesy? Hope you saved me one! Again, I will let everyone know when the psychedelic bus is rollin’ by with food! Thanks. Romesco sauce is a Northern Spanish condiment. Green chilis from New Mexico. Feta. This is an international dish! We have a food truck that comes to the park across the street every Tuesday. We just discovered it, so not much cooking on Tuesday’s now. 🙂 What a fabulous burrito! 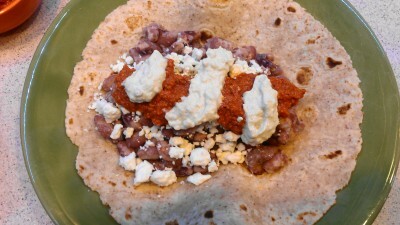 I love those Anasazi beans and your Romesco sauce sounds wonderful! Can’t go wrong with feta on a burrito! YUM! I’ve never eaten at a food truck and we even have a popular one in Wichita-need to get on it! Debra, I’m not kidding you, as soon as I scrolled down to the final beanie cheesy wonderfulness picture (I often scroll through pictures first, then read later), I got up and had to make myself a bean burrito. It only took me five minutes and was not epic like the Silver Bullet but it hit the spot. The things you do to me! lol. Looks soooo so incredible! I agree, Hatch green chiles are the best. This looks like one tasty dish! There is a Waffle Truck that is around town, I’ve got to try it. People say it is one yummy dish. Oh my heavens that looks fantastic! how could you eat those beautiful beans?!?! I bet it would go fantastically with those pickled carrots you just posted. I’m way behind on reading because of the wedding and now the tornadoes! Just missed our house and on the way to your side of the state now. Stay safe!! Thanks, we are sitting on the patio and watching it go SE of us. Glad you were missed. Love this fusion burrito! As well as food trucks. Is there anyone who didn’t want to have a bus like the Partridge Family growing up? I’m pinning this to my Recipes to Try board for when my vegetarian daughters are at home. Delicious! If they like spicy, I would kick up the romesco sauce and the green chile sour cream a bit. I am adding jalapenos to this dish as soon as I get some from the garden! We all like spicy so jalapeños would be a wonderful addition. Thanks! That looks delicious – who would ever think of getting such wonderful chow from a food truck. Growing up, the food truck far was aimed at construction workers who liked burgers, plain sandwiches and hot dogs. Lookis good and great foodie advebture. You ahve temps in the 40’s and we are dealng with 90s. What a difference! Food truck food is just the best. And this looks like something I would just love. I’m always on the hunt for great beans recipes, and this is definitely on the list. 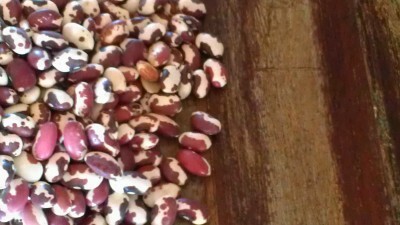 I need to get some Anasazi beans – I’ve not worked with them yet. I overcooked mine just a bit. I need to check, is the Great Food Truck Race on. I love them all! Of course in my remote part of the world there is no such thing as a food truck….we had a BBQ one once, but it gave up and opened a restaurant. I think I’ll have a burrito for breakfast…wish it was yours! That sounds like a great plan to start the day.